At least that’s what the market keeps hearing, and what was floated during the very first panel – called “The Death of the Main Sale” – at RepubliCon in Manhattan on Thursday. The event, hosted by crowd investing platform Republic, saw a number of crypto industry stakeholders discuss the cooling (by some measures) of the hype around the nascent fundraising mechanism called an initial coin offering. Indeed, July was a slow month, with CoinDesk’s ICO Tracker showing that project founders didn’t manage to break even a billion dollars. Although, there’s still a lot of money trading hands. While everyone agrees that 2017 was the raucous year with ICOs garnering huge sums of money based on unrealistic expectations, 2018 topped the prior year’s numbers by April. “By ‘main sale,’ I mean the public ICO in the fashion we saw late last year,” Jed Halfon of Republic said as he introduced the panel participants. According to Nelson Chu of Cadence, a company developing a security token, entrepreneurs and projects are finally seeing the weight of regulation. “It’s died not because of any other reason other than companies are running afoul of regulators,” he said. Panelists and participants on the floor seemed to share the opinion that a certain era – the era of raising epic amounts of money with little more than a white paper –of ICO has come to an end. 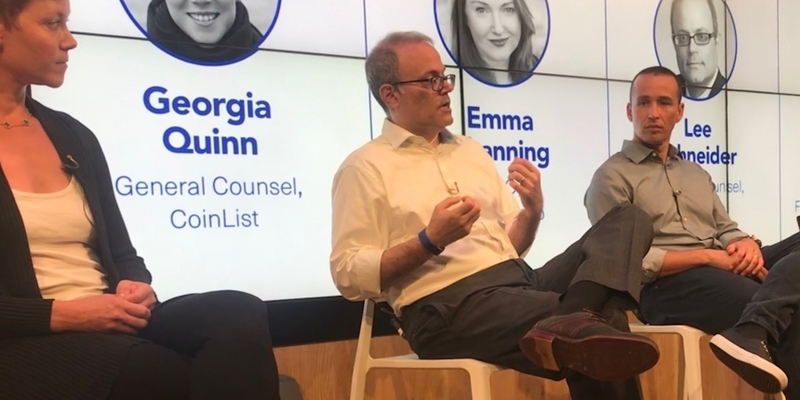 “I think what part quote-unquote ruined it is all the money people raised,” Lee Schneider, an attorney now with Block.One, the company that built the EOS blockchain, said during the panel. Yet, others weren’t as pessimistic. And Ryan Alfred, co-founder of the blockchain oriented asset management firm Distributed Global, said the technology and mechanisms for utilizing the technology are just evolving naturally with the times. There did appear to be a consensus on the floor that crypto founders will be pressed more to deliver a real product going forward. In fact, the very deals they make with investors could become more and more structured around delivering. Blockstack already did this with its ICO and there was also discussion on stage about ethereum creator Vitalik Buterin’s Decentralized Autonomous ICO (DAICO) model, which would allow investors more of a say in how the money raised is used. “In an industry building on governance, there’s no governance for founders in the ICO process,” Randy Mundy, the managing partner at a new firm looking into blockchain called Techlete Ventures, told CoinDesk. Mundy liked the idea of tranches of payments to founders, whether it’s with a DAICO or something simpler. Pat Zailckas, of Clockwork, a due diligence company that works with Republic, among others, agreed. He said the “burden on the founders will become more intense,” whether that means funds will only release when milestones are hit or founders commit to building a certain amount of technology based on how much money they raise. Georgia Quinn of CoinList floated the idea that many companies that ICO’ed should have raised money in a more traditional way. Whatever may happen, nearly everyone at the event agreed that the entrepreneurs behind crypto projects, especially ones using the ICO method, need to be clearer about what they’re about and what they plan on doing with any money raised. No doubt, investors have already started wising up to the opportunity presented by long delays in launching products. When companies release a token long before anyone can actually use it on the platform, the token price often drops at some point below even its ICO or private sale price. While the panel focused heavily on the atmosphere in the U.S., various participants on the floor pointed out that, in a different part of the world, the hype surrounding ICOs has yet to die down. For instance, in Asia, even though there have been various calls for crackdown on the industry, many people are still participating in crypto fundraising. Still, most people at the event agreed that entrepreneurs don’t need to raise huge amounts of money to be successful. “The most interesting teams are raising less than $10 million,” Alfred said, pointing to projects like FOAM and Livepeer, which have progressed quickly on relatively small ICO raises. So the main sale isn’t dead, but it is more modest. Photo by Brady Dale for CoinDesk: Lee Schneider speaks on the first RepubliCon panel, with Georgia Quinn and Ryan Alfred.